Offering you a complete choice of products which include guarana extract and burdock root extract. 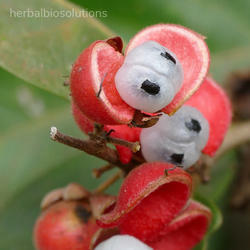 Guarana Extract is a shrub or small tree native to Venezuela and northern Brazil, known for the high stimulant content of the fruit. The name 'Guaraná' comes from the Guarani tribe that lives in Brazil. I t has divided compound leaves, flowers yellow panicles, fruit pear shaped, three sided, three -celled capsules, with thin partitions, in each a seed like a small horse-chestnut half enclosed in an aril, flesh colored and easily separated when dried. The seeds of Paullinia Sorbilis are often used or mixed with those of P. Cupana. They break with an irregular fracture, have little smell, taste astringent, and bitter like chocolate without its oiliness, and in colour like chocolate powder; it swells up and partially dissolves in water. A crystallizable principle, called guaranine, identical with caffeine, which exists in the seeds, united with tannic acid, catechutannic acid starch, and a greenish fixed oil. Brazilian Cocoa, Uabano, Uaranzeiro, Paullinia Sorbilis.